3.3 Decell/recell: the ultimate biomaterial platform? 4.4 Can neo-bladder constructs be made from cells sourced from diseased patients? 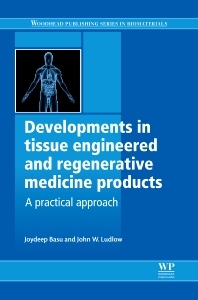 Developments in tissue engineered and regenerative medicine products summarizes recent developments in tissue engineering and regenerative medicine with an emphasis on commercialization and product development. Features of current cell therapy and tissue engineered products which have facilitated successful commercialization are emphasized and roadblocks to successful product development are also highlighted. Preclinical and clinical testing of tissue engineered and regenerative medicine products, regulatory, quality control, manufacturing issues, as well as generating and securing intellectual property and freedom to operate considerations are presented. This book represents a complete 'how-to' manual for the development of tissue engineered and regenerative medicine products from conceptualization to clinical trial to manufacturing. Dr Joydeep Basu is Senior Scientist, Bioprocess R&D, Tengion Inc., in Winston-Salem, North Carolina, USA. He has over 10 years' experience in the creation, research and development of cell therapy, gene therapy, regenerative medicine and tissue engineered products within entrepreneurial biotechnology companies including Athersys Inc (Cleveland, USA) and Tengion Inc (North Carolina, USA). Dr. Basu is a recognized global authority on the development of non-integrative gene therapy products and has published and presented broadly within the field of regenerative medicine/tissue engineering. He is currently focused on driving development of Tengion's tubular organ regeneration platform technology for applications beyond regeneration of bladder. Dr John W. Ludlow is Senior Director, Process Research and Assay Development, Tengion Inc., in Winston-Salem, North Carolina, USA. With experiences as Director of the Cell Therapy Program at Incara Pharmaceuticals, and Senior Director of the Cell Therapy Program at Vesta Therapeutics (North Carolina, USA), he has achieved demonstrable successes in managing and directing therapeutic area-specific research and regenerative medicine and tissue engineering product development. Responsibilities have included bringing new products into bioprocessing research and development, taking new products to demonstration in animal models, GLP and non-GLP production, and initiation of human clinical trial sites. Dr. Ludlow has previous held faculty memberships at the Rochester Institute of Technology and the University of Rochester Cancer Center, with authorship on over 80 scientific publications.